Nick was a 2004 graduate of Timken High School in Canton, OH. By his sophomore year in high school, he knew he was going to join the military and protect his county. He joined the Air Force in 2007 but soon switched branches, when he joined the Army where he served with the 7th Special Forces Group. Nick married his wife Rachelle and they had two boys, Nicholas and Curtis. They started their family and traveled base to base ending at Fort Bragg, NC. On Nick’s first deployment he was sent to Iraq for 18 months and returned home to enjoy time with his parents, in-laws, brother, sister and friends. He also made time to visit his coaches and teachers while back in the states. He was a wonderful man, son, father, husband and friend. Nick was very likeable and loveable. 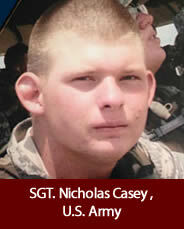 In the summer of 2008 on his second deployment, he was sent to Afghanistan and was Killed in Action that October. We are reminded daily of the wonderful young man Nick was and how he loved his family. He is missed and loved dearly. We are so very proud of his service and sacrifice to our great country.